As medical device complexity increases, we continue to invest in our platform to help you improve collaboration in your development process and better mitigate risk. That’s why we’re excited to announce the immediate availability of the Jama Connect™ Risk Management Center  for Cloud customers in the 8.33 Release. This takes Risk Analysis out of an Excel spreadsheet and into Jama Connect, providing access to your broader team and connecting requirements directly to risks, early in the development process. By working with live data in Jama Connect, teams ensure they are viewing and properly mitigating risks in real-time with confidence, so they can move quickly to the next phase of development. To learn more about the Jama Connect Risk Management Center, check out our blog post with a demonstration video and contact your account manager for more information on pricing and setting up a trial. A completely new module for Jama Connect, Risk Management Center appears as a familiar tab accessible directly from the Jama Connect homepage with instant access to all of your risk analyses. Development teams can begin to conduct risk analysis by identifying hazards, hazardous situation and harms. Risk Management Center takes care of some of the administrative challenges that Excel may have like merging and splitting cells and conditional formatting, enabling you to spend more time on Risk Analysis and less time on configuring spreadsheets. 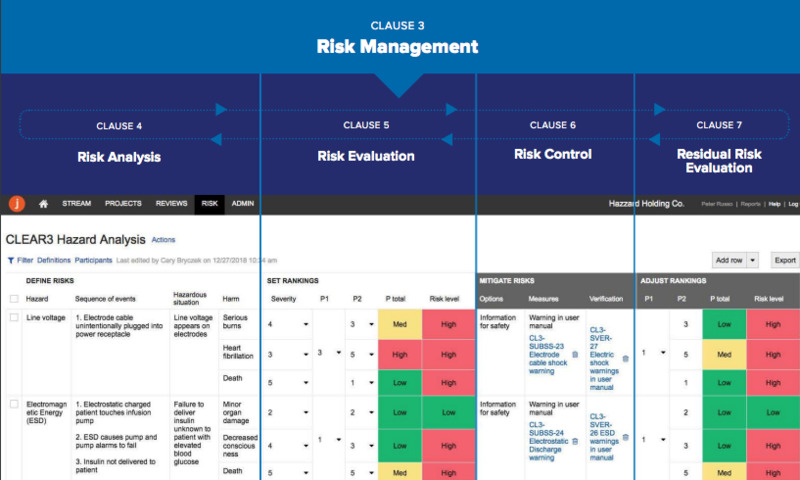 Once identified, users can evaluate risks by assigning severities and probabilities to each harm, and see the Risk levels associated in an easy to use format - based on Annex E of ISO 14971. Risk Management Center also allows you to mitigate and classify risks, adding measures and verifications for the requirement that you will link, and allows you to link to an item in Jama. Once risk control measures and verifications have been applied, cross-functional teams can then evaluate if risk control measures have reduced the likelihood that the hazardous situation may occur. By working with live data, teams ensure they are viewing and properly mitigating risks with confidence, so they can quickly move to the next phase of development. Analyses can be exported to a spreadsheet, allowing teams to add risk analyses to their document control system. Templates can also be configured to meet the needs of your risk management process.